Masked police operatives have stormed the hospital where Dino Melaye, the Senator representing Kogi West, was receiving treatment. The officers forced the lawmaker, who was on the hospital bed, into an unmarked vehicle and drove him to an undisclosed location, witnesses told Premium Times. He turned himself in after hiding in the house for days. Mr Melaye has been in the hospital since then. 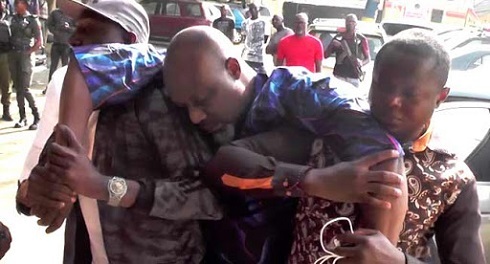 Police accuse the senator of being involved in the shooting of an officer in his native Kogi State. More to come later.